We all know about positive quotes about woman and her lipstick, such as " Give a woman the right lipstick she can conquer the world" or "If you're sad add more lipstick and attack" etc. Since when I'm a little girl, the very first thing that I stole from my mum's makeup table and apply it on my face is a stick of lipstick. I personally think that lipstick has this mysterious attraction to all the women and we just wanna collect every colour, every design. In year 2018, THE lipstick that you shouldn't miss collecting is the 50GRAM x Swanicoco Show The Velvet Lipstick. 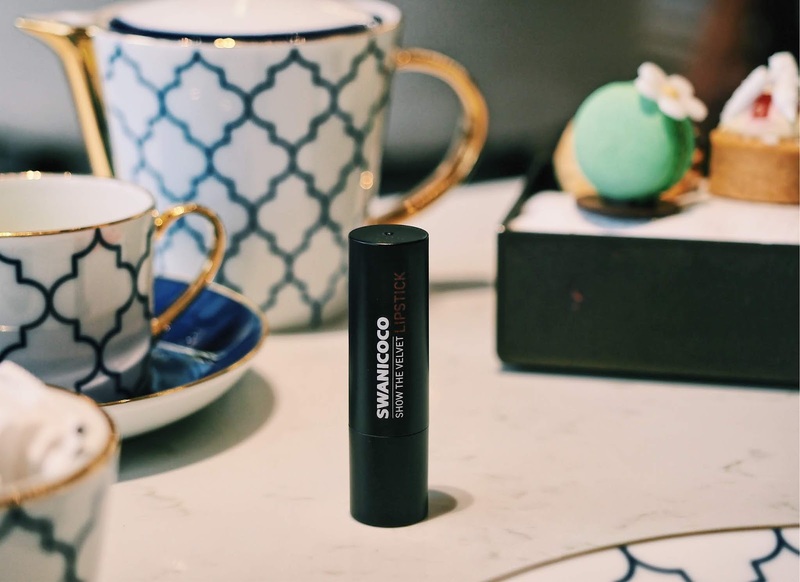 Swanicoco is the hottest brand in Korea this year and they are famous for producing natural cosmetics products with their natural biotechnology research. The name Swanicoco represents elegance (Swan) and natural ingredients (Coco), the brand's cosmetics products with Bio-Fermentation process received a huge hit. 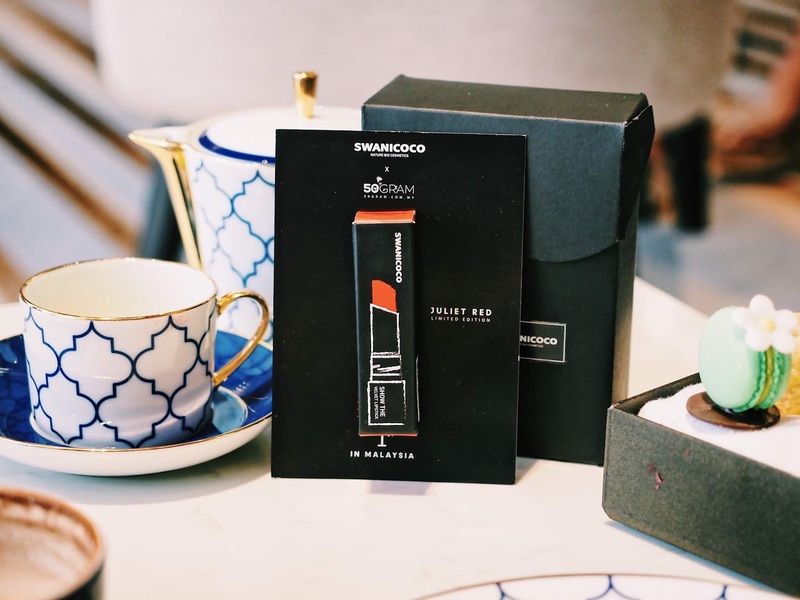 With more than 80% fermented extracts from natural source such as grains, fruits, vegetables and Korean medicinal herbs, Swanicoco's eco-friendly products helps improve skin conditions. I like the sturdy packaging of the lipstick, plastic with matte finishing outlook does add on some classy touch. I was surprised by their twist-to-open lipstick cap because I love cap like this! Although it may causes some slight inconveniences (touch up with one hand with mirror in another hand perhaps?) but I wouldn't find the lipstick cap fly off inside my bag and all my stuff were smudged by lipstick. I don't have to tell you how many times I had to clean my bag and stuff because of a loose lipstick cap. 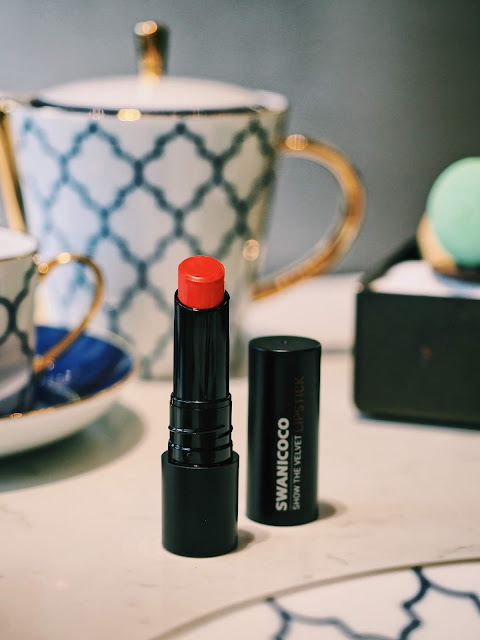 Definitely a yes to a secure lipstick cap like Swanicoco's! 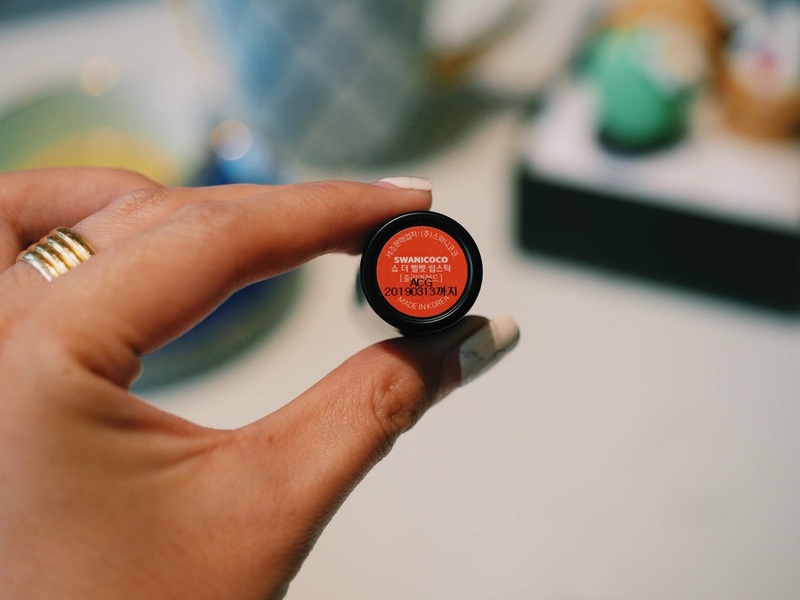 This fiery bold red with a hint of orange lipstick is perfect for the summer ( yays to Malaysian for having summer all year long!) and also for those who wanted their skin to look few shades fairer. The colour does compliments certain skin tones to make whole appearance looked brighter and cheerful! 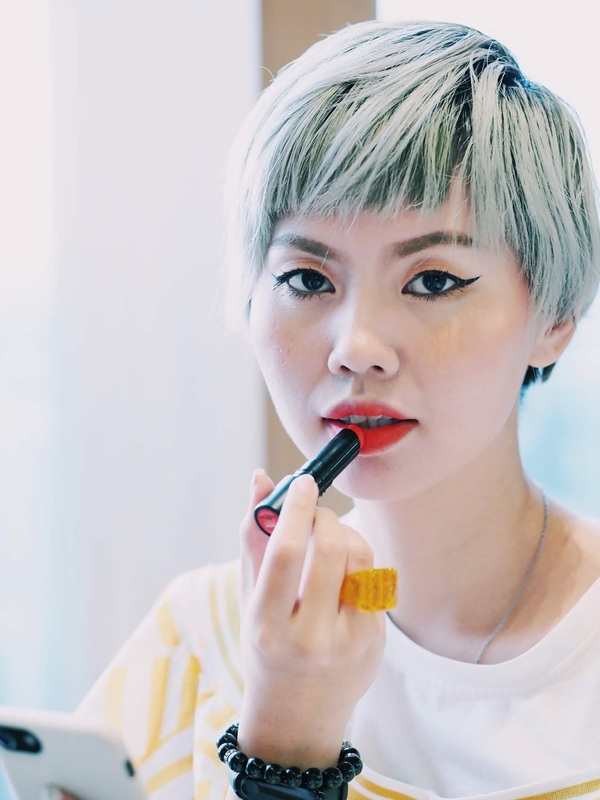 Not to mention the lipstick colour is super vibrant even I apply only a layer on my lips! One layer and my lips looking so kissable! This lipstick gave my lips a velvet finish with tons of moisturising ingredients such as carnauba wax and castor oil to protect my lips. 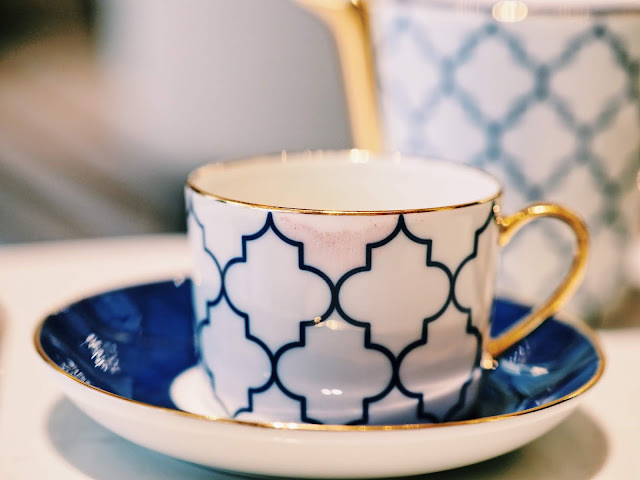 I can feel that my lips are as in covered in velvety duvet, lips looking more supple because powdery finishing lips shows lesser fine lines too. 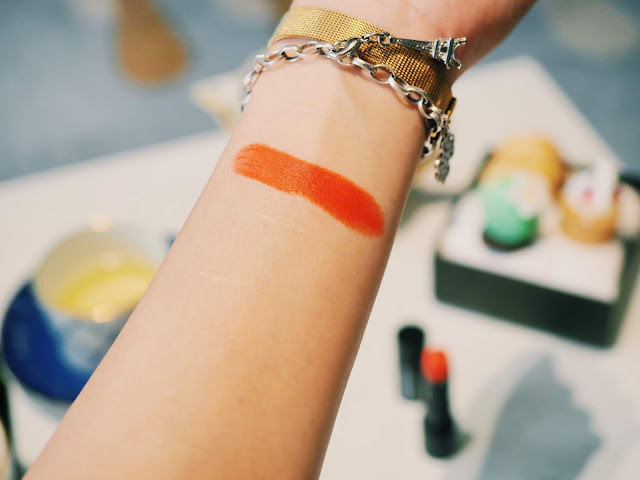 This aside, it's a super long lasting lipstick as well because I remember I don't even have to do any touch up after the high tea session! Perfect lipstick for a lazy girl like me lololololololol.